It's amazing how something little can really make a day great! Being a Wednesday, it was very slow-starting and I woke up super sluggish. We are doing inventory of all our furniture at work in preparation for a move. You all know how exciting inventory is - about as fun as doing taxes! Anyways... in the cleaning of the basement that a co-worker was doing, she found some Spaten Optimator glasses. Who knows where those came from, but somehow they ended up in Marketing! I thought they were SO COOL! Amazingly, no one else wanted them, so I excitedly horded them immediately! I've always had a thing for glasses, and water bottles, and bags, and containers... Can anyone else relate? When I want to drink more water - I purchase a new water-bottle. I want to get more organized? I get a new basket. You know at Trader Joe's when they have a new, cute design for those recycled grocery bags? I just can't resist!!! 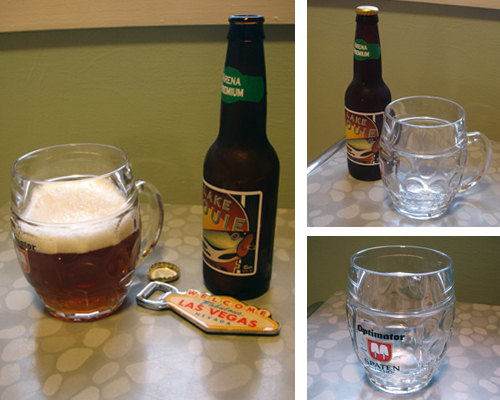 Plus, beer glasses are some of the coolest out there! My aunt and Uncle have this amazing collection of thermal plastic beer glasses - many of which are old Schlitz beer brand designs. Uncle Dave always raves about how he has had them since the 70s, and I love hearing those stories! Awesome retro stuff is always the coolest! Yay, to a FREE glass to add to my collection!